I checked the screens and saw that my flight was now ready to board, with that my months of anticipation were finally over. I was going to take seat 1A in TG F ! My first impression was one of space and light. There are so many windows to look through. The cabin is self contained in a really cool way. There are 2 lavs at the back of the cabin, with the doors facing towards the seats, rather than the galley. The galley then runs vertically down the length of the lavs, instead of cutting horizontally across the fuselage, as in most planes. Somehow this arrangement makes the cabin seem more spacious and private than usual. The cabin shows its age a little, with the usual scuffs and scrapes one would expect on a 747. 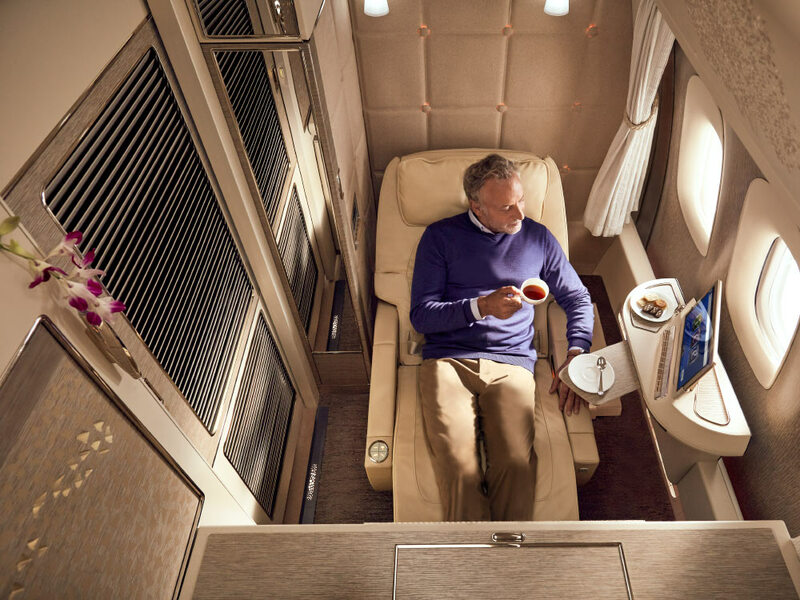 However, no other cabin ever feels as exclusive as the nose of a jumbo. Upon taking my seat, I immediately reached for the white Rimowa kit and noticed that there was a black mark on it. This quickly fell to the back of my mind, as I saw a male FA approach with a bottle of Dom. He greeted me by name and asked if I would like a glass. I of course, obliged. He showed me the label, poured a glass for me and placed it on my windowsill, along with some mixed nuts. I thanked the FA and mentioned the stain on the amenity kit, he was very apologetic and asked if there was another colour I would prefer. I told him white was fine and he immediately returned with a new kit. With that I began to gently sip my Dom and enjoy the views on the tarmac. Unusual livery (does anybody know what the deal is with this)? One of the big advantages to the old F cabin, is the amount you can see during take-off and landing. When we finished taxiing and the engines revved up for take-off, the feeling was exhilarating. Seeing the world rushing past, through 15 or more windows, gave me the impression that I myself was flying. As opposed to the usual feeling of just being along for the ride, in a metal tube. The FA addressed me by name and said that my pre-order of Lobster Thermidor had been noted but I was free to change my mind. I thought this was a nice touch, a real indicator that First Class gives you choice and freedom in addition to the extra space. I was served another glass of Dom with my amuse bouche. The amuse bouche wasn’t anything particularly special but being moderately spicy and fried, I destroyed it in about 2 seconds. Then came a hot towel. I hear that one FT'er in particular, is keen on these. The caviar trolley was something I had really been looking forward to. Somehow seeing it wheel by, in this slightly aged cabin, gave me the impression of having travelled back to a bygone era. When the majority of your flying is done on Ryanair and Easyjet; the sight of a polished trolley draped in linen, amidst a quiet - punctuated only by the clinking of spoon against crystal serving bowl, is quite surreal. The caviar itself was of a decent standard, with large pearls and a very smooth, buttery, mouthfeel. I chose to keep my use of garnishes to a minimum, on the caviar itself, but soon realised I was hungry and boozy; so I decided to just eat heaps of garnishes on bread, before the main course was served. This served to immediately eliminate any aspirations I may have had, of being a man of refinement. Next up was the salad and pork terrine. This took me longer to eat, than the amuse bouche perhaps 30 seconds. This course seemed to be a ‘by numbers’ affair more than anything else. i.e. a salad course is required in international F class, so this one will do. Not a complaint per se, more of an observation. I could easily have done without this; although I guess the salad served to assuage my guilt over the endless stream of food, that I was already on course to consume. Next came the lobster Thermidor. Not bad at all. The flesh was soft and mixed well with the béchamel. I prefer a little more crunch (supplied by carrots and celery) when I cook this at home, also I would probably choose different vegetables. There is something a little cheap in the presentation of the peas and tomato. After this, I was asked if I’d like some fruit or cheese. I figured, ‘what the hell’ and went for both. The cheese was served at the correct temperature with a decent glass of port. Hard to screw that one up. I brought my lunch to its conclusion with a ballet of chocolate based savagery. Crisp resonant shell, yielding to unctuous liquid and mousse in the centre. The espresso that accompanied it? Good, not just good for a plane but actually an espresso I would like to drink. My pet peeve is bad coffee in premium cabins (1% problem), so glad that TG are on top of this. After all that I was ready to kick back with a movie from the IFE. The choice was decent and the system was fairly responsive, although the picture quality could have been better. After the movie I decided to try and get some rest, as soon as I got up with my PJs in hand, the male FA came over and asked if he could make my bed. Throughout the flight this guy was on fire. Cranking out his hospitality A game. He was not just responsive but also proactive, whilst also able to make jokes. Not an easy job at all. Seriously, all the FAs were great but this guy took it to another level. Anyway, I came back to a made bed. At which point a few others asked to have theirs made. At this point I need to mention the quality of the PJs. They have buttons on the sleeves and partially down the front, the colour scheme is very muted and elegant. Aside from this, they are comfortable, stretchy where needed and not shaped for obscurely rotund people with thin legs (a major issue with almost all airline PJs). I’ve kept and used these since and would say they are the best airline PJs I’ve come across. A friend of mine flies TG F regularly and gave me one of the old, baby blue, PJs. The difference in style and quality to those, is like night and day. After all the beds were made, the cabin lights were dimmed, and a selection of drinks was left in the centre station of row 2. I have to say, that leaving a proactive bottle of Dom on ice, next to me, is one of the greatest things anybody has ever done. The pour it yourself, bottle of Dom, is reason enough to fly TG F in my opinion. After a few hours of watching movies and drifting in and out of micro sleep - not an indictment of the bed, more a reflection on my inability to sleep in dry cabin air - it was time for breakfast. I started with another excellent double espresso, followed by a really fresh fruit salad. The quiche was a claggy, sodden mess of dough and oil. The rest of the dish was not much of an improvement. If TG want to work on bettering their F&B I would suggest they look here first. Honestly, this dish would not have been out of place in economy. Overall not a huge problem for me though. As long as I have good, strong coffee at breakfast. I’m happy. The landing was even more epic than the take-off. Hearing the landing gear deploying about 2 foot beneath me, air screaming past it, followed by a final clunk, was awesome. Seeing the lights of BKK flying past the cavernous cabin’s windows, punctuated by the powerful beast’s thud onto the runway was one of the most incredible things I’ve ever experienced. Honestly, suites are great but seeing a side view of a landing, from 3 windows, on an A380 is nothing compared to the noise, energy and massive 15 window view on a 747. Where the A380 gently glides onto the runway, the 747 headbutts the runway and screams at it. Horses for courses but I know what I prefer. Our taxi through BKK took us past a menagerie of TG planes including a couple of whale jets. I snapped some pics excited to see the plane that may well be taking me on the next a leg of my journey, in a few days’ time. F deplaned first and we were immediately greeted by TG assistants, bearing our names on signs. There was no buggy as we were literally 20 yards from immigration. My assistant took my hand-luggage and passport and then whisked me through the diplomatic immigration channel. He then told me to take a seat by the luggage reclaim, waited for my suitcase, loaded it onto a trolley and took me to the taxi rank. At this point the taxi driver took my luggage and drove me down the almost deserted highway to Lumphini, site of my hotel: Sofitel So Bangkok.